We’ve been writing about politics for six months now (thanks for sticking with us), in part to promote CROSS, but also because we’re real advocates of thinking about and participating in elections and politics more generally. Join us on Saturday at Birmingham Comics Festival! Delighted to be hitting the road again this weekend and heading to Lizzie‘s home city of Birmingham! Birmingham Comics Festival runs from 9am – 6pm this Saturday, 18 April, at Edgbaston Cricket Ground. And the line-up looks FANTASTIC! We’ll be there with copies of political satire anthology CROSS, a brand new print run of Sentient Zombie Space Pigs 1 and 2, sketches, artwork and much more. We’re also happy to talk to writers and artists who are just starting out and want advice about, well, anything! Politics for sale – in your local comic shop! Good news, comics fans! 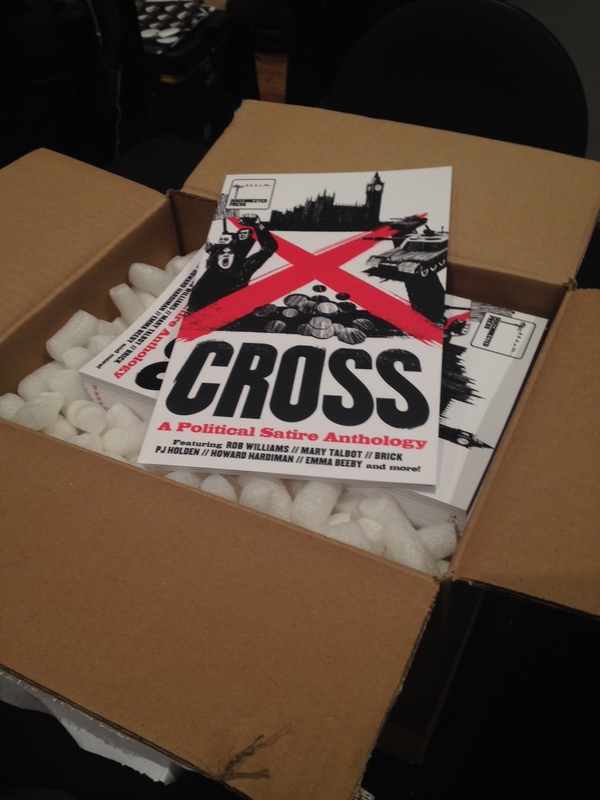 Our political satire anthology CROSS is now for sale at a number of great comics shops, with more to follow. Politics, humour, robots and flying squirrels ahoy at Abstract Sprocket in Norwich, the first time this lovely shop has hosted a Disconnected publication (and the only one of the shops on this list that we haven’t yet visited!). We met Iain and Callum at Area 51 on Saturday and almost didn’t make it out of this real treasure trove of comics, sci fi books, board games, models and memorabilia. Head to the small press West Wing of Orbital for far too much choice in independent comics. Remember, you’re looking for CROSS, right? We’ll also have news later in the week about another stockist in London, one in Devon and – we hope – some a bit further north too! So no more excuses about not trusting internet shopping. 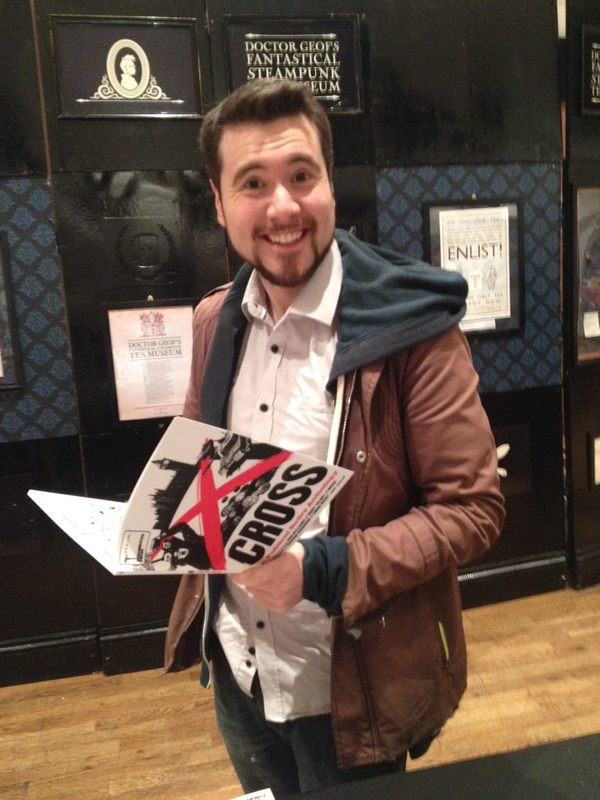 Get out there and get your copy of CROSS. 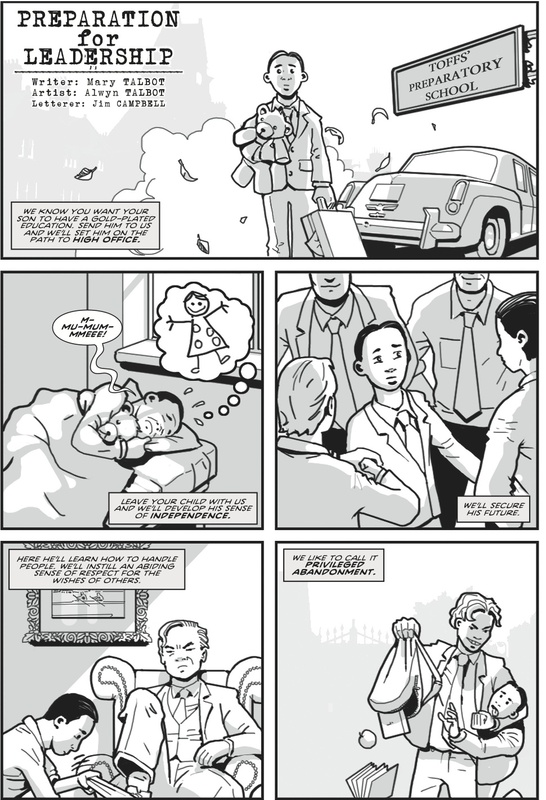 With two months to go to the election – only a comic can help! PS. If we’re not in your area yet, don’t despair – we’ll be selling copies at Birmingham Comics Festival and Edinburgh Comic Con in April, and you can still order online at our trusted Comicsy shop. London Super Comic Con – 14-15 March, Excel London: we won’t have our own table at Excel this year, but the amazing Verity Glass – aka Anadapta Art – will be selling copies of CROSS at her table (D130). Verity first featured with us in Disconnected 3, with her jaw-dropping art for The Place The Big Boys Go, written by Owen Johnson. Seriously? You haven’t seen it? Get yourself over to our Comicsy shop right now and order yourself a copy! 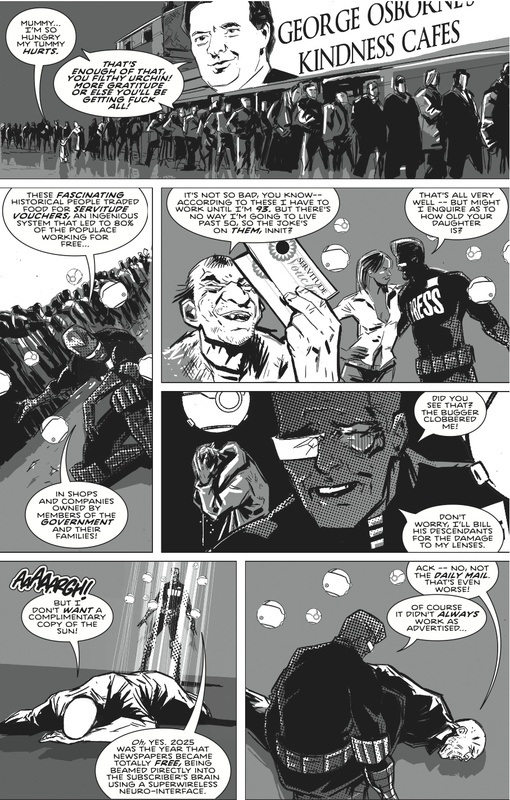 Verity also features in CROSS, illustrating It’s A Sh*t Life by 2000AD writer Tom Eglington, and is now working for Titan Comics. Go say hello – buy CROSS and ALL HER OTHER ART TOO! Edinburgh Comic Con – 11-12 April, Potterow, Edinburgh – we’ll be heading north of the border to Lizzie’s old stomping ground in April for Edinburgh Comic Con. Delighted to see that Disconnected discovery Tom Foster is a guest – here’s a picture of him enjoying a very fine comic book indeed! From humble but obviously brilliant origins in Disconnected 1, Tom has graduated to drawing regularly for 2000AD, and appears as both writer and artist in CROSS. Birmingham Comics Festival – 18 April, Edgbaston Cricket Ground – we’ll be in Brum mid April for the first Birmingham Comics Festival, which promises to be a great day out with an incredible array of guests, exhibitors and general mayhem. You’ll find Disconnected artist Conor Boyle‘s artwork on display in various places – very probably the FutureQuake, Accent UK and Markosia tables as well as ours! We’ll be announcing more convention appearances soon. If you can’t make it to one of the above, you can find CROSS at Orbital Comics in London or order a copy directly from us via our online shop at Comicsy, the UK comics industry’s very lovely and trusted online retail hub. Saturday 7 February will see Disconnected Press – and many others – descending on Cheltenham Racecourse for The True Believers Comic Festival. In honour of our trip to the home of GCHQ – and my discovery of a new Cheltenham related fact about old-school spies Burgess and Maclean – we turn our attention away from politics and towards the world of surveillance. This makes an appearance in CROSS, courtesy of Owen Michael Johnson and Conor Boyle‘s story Security. Conor Boyle‘s artwork brings Security to life. Conor turned his hand to matters historic in drawing On Dangerous Ground, the National Trust for Scotland’s graphic novel of the Battle of Bannockburn (see Down the Tubes’ article here). This followed Pirates of the Lost World, and Who On Earth Was Thaddeus Mist?, both from UK publishers and both set in the 19th century, making him very excited to draw anything that has modern technology in it. If you can’t make it to Cheltenham, follow this handy link to our Comicsy shop, and you can buy your copy there. CROSS features the work of some of the finest established and emerging UK comics talent including Rob Williams, Mary Talbot, David Baillie and Emma Beeby. Don’t get mad: get CROSS! Sometimes the political sphere creates strange bedfellows. Imagine a party that was committed to free university education, non-renewal of Trident, tackling climate change, proportional representation and replacing the House of Lords. Then pop them in a coalition with a party that felt, well, somewhat differently. And see what happens? 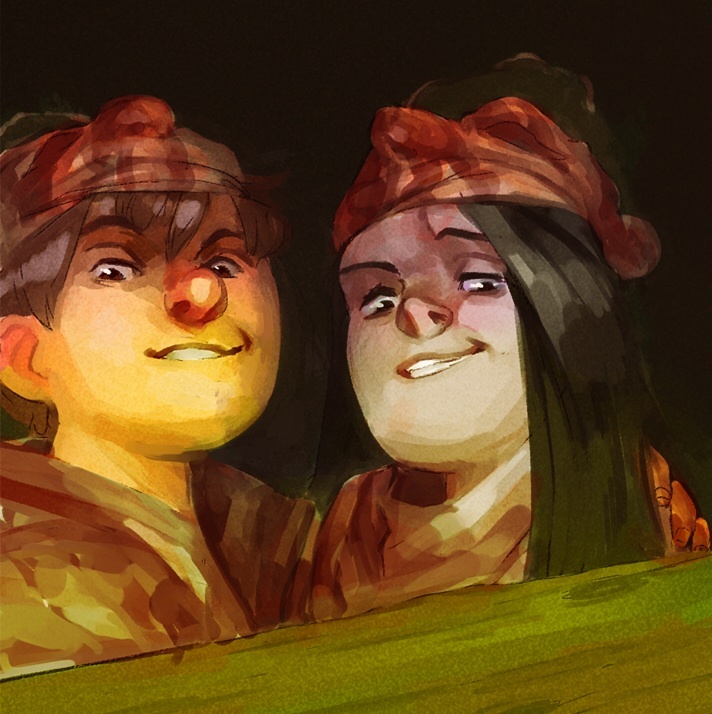 Emma Beeby’s latest graphic novel Robbie Burns: Witch Hunter is available from Renegade Arts Entertainment and your friendly local comic store. Gavin Mitchell’s art is featured in Disconnected Vol 1 (virtually sold out but there is a single print copy in Orbital Comics in London! ), and in Stiffs and Santa Claus vs The Nazis. His blog is at http://gavinmitchell.blogspot.co.uk/. Today marks the launch of campaigning for the 2015 General Election. 121 days to go! 121 days of photo opportunities, baby kissing, gaffes, apologies, hirings, firings, outlandish commitments, fragile promises and – we hope – some very fine satire and sarcasm from the nations writers and cartoonists to pull the rug out from under the whole thing. As campaigning starts, we wondered: what makes a person decide to go into politics? Someone asked Benjamin Disraeil (who he?) why people became Member of Parliament? “We come here for fame,” he replied. Now I’m not sure if that still holds true. There are easier ways to become (in)famous these days. Irritatingly catchy, Youtube-sensation pop songs. Daytime television. Inappropriate fancy dress. The possibilities are endless…. So it must be something else that draws people into politics and into Parliament. 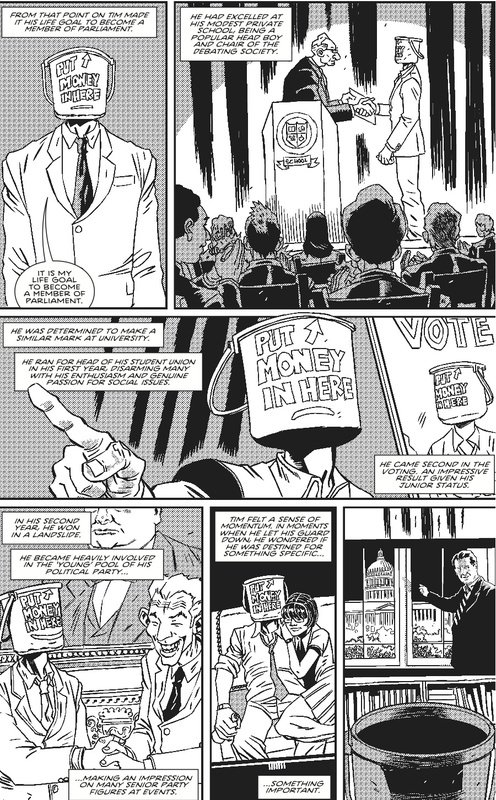 This is the theme for MoneyBucketHead, Rob Williams and PJ Holden‘s story of Tim, a young man of principle who follows his dreams… MoneyBucketHead features in CROSS, an anthology of political satire which aims to make people sit up and think – then get up and vote – in this year’s election. 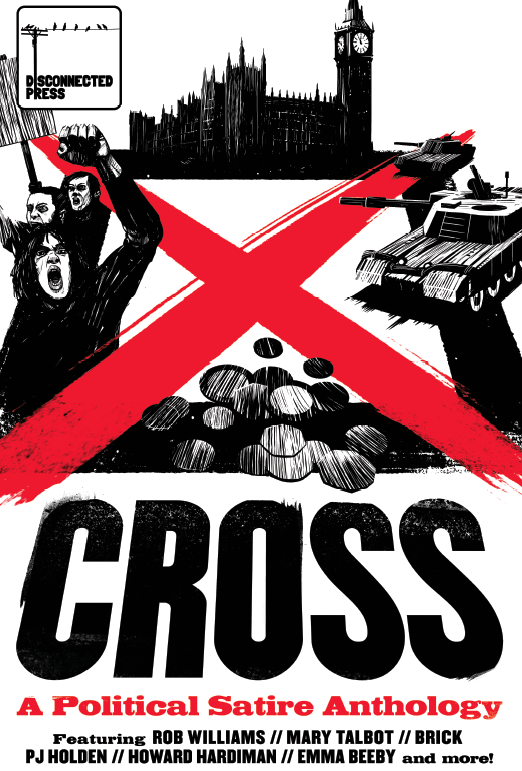 Featuring work by some of the UK’s finest writers and artists, including Mary Talbot, David Baillie, Howard Hardiman and BRICK, CROSS takes aim at all sides of the political divide in 64 pages of anger, humour and the occasional robot. Back to why people want to become MPs: here’s a great article from Prospect Magazine, a thought provoking defence from a Labour MP, and in the interests of balance, a feature about becoming a Tory MP. 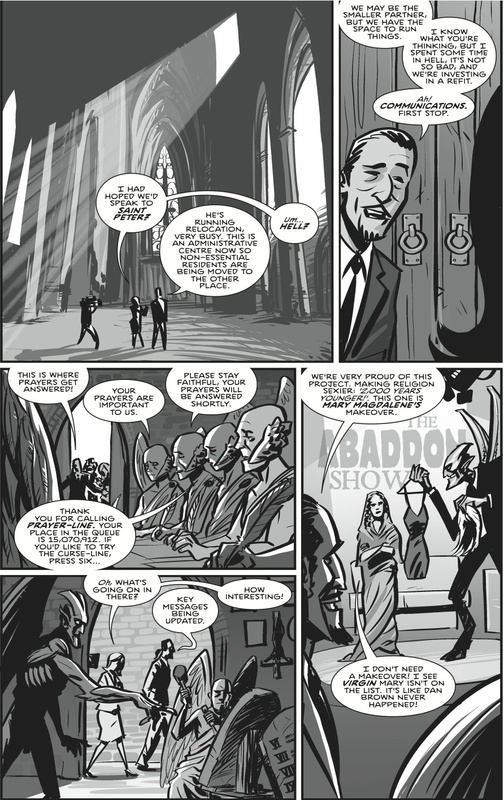 If becoming an MP is a bit much, then why not start by reading our comic 🙂 You can order your copy of CROSS at http://www.comicsy.co.uk/disconnectedpress/ for just £10 plus P&P.